I'm a big fan of crumb cake. My favorite has to be Starbucks' crumb cake, by far. I hadn't attempted to make my own prior to Mother's Day, but I decided to give it a try. I found this recipe in the May issue of Cooking Light. I was pleased with how it came out, except I ended up baking it in a 9-inch springform pan instead of the 8-inch pan the recipe calls for, so it came out a little flatter than it should have. I couldn't tell this was a low-fat recipe either. It was very tasty, and the strawberry jam gave it just the sweetness it needed. Only 191 calories per slice! 1. Prepare crumb topping. Combine 1/4 cup flour, brown sugar, and cinnamon in a small bowl. Cut in 2 TBSP butter with a pastry blender or 2 knives under mixture resembles course meal. Set aside. 3. 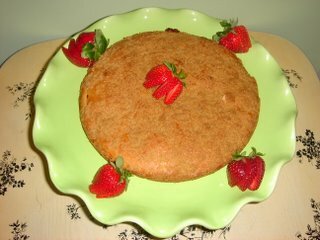 To prepare cake, lightly coat an 8-inch springform pan with cooking spray and set aside. Combine 1 1/4 cups flour, baking powder, baking sode, and salt in a small bowl, and set aside. 4. Combine powdered sugar and 1/4 cup butter in a large bowl and beat with a mixer at medium speed until well blended (about 2 minutes). Add vanilla and egg and beat 2 minutes. Combine milk and juice, add to sugar mixture, and beat 2 minutes. 5. Add half of flour mixture to sugar mixture and stir until smooth. Add remaining flour mixture and stir until just combined. 6. Spoon half of batter into prepared pan, spreading evenly. Top with strawberry spread. Spoon remaining batter over strawberry layer, spreading evenly. Sprinkle crumb topping evenly over batter. Bake for 45 minutes or until toothpick inserted in center comes out clean. Cool 10 minutes in a pan on a wire rack, then remove from pan. Cool completely on wire rack. Makes 12 servings. Yummm! I must try that! Yum. Sounds wonderful. I like strawberry anything. I might have to give this a try! I love strawberries and cake! I think I'll try making this this weekend. Can I just use a regular cake pan and not a spring form one? I have a whole pile of homemade strwberry jam that is too sloppy... it would be perfect for this! Mmmmm! And I love that green wavy plate! It even sounds "not too sweet" for the likes of me, the non-sweet-tooth woman. So pretty! Aren't strawberries just gorgeous? Yum! Such a great summer recipe. I have *teeny tiny* strawberries growing in my front yard. If I send them to you will you send them back in cake form to me? Ramona and Marie-Let me know if you do! L-I think you could definitely use an 8-inch round pan. I would just line the bottom with parchment paper and spray it with cooking spray to make sure the cake comes out easily. Shannon-Thanks! I love it too. Annelyn-It definitely isn't too sweet. I don't like overly sweet things either.